Does anyone else love peeking into other people’s refrigerators and seeing what products are in there? Call me nosy but I absolutely love when bloggers post photos of what the inside of their fridges or cabinets. Some of my favorite products have been introduced to me from some of these posts. Having a well-stocked pantry is absolutely key to keeping up with my healthy lifestyle. 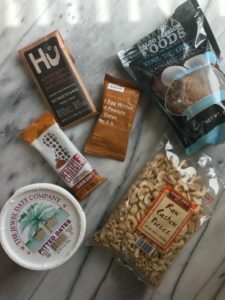 When your favorite products are right there, there is no excuse to not grab a healthy snack or spend money on something that I could easily make at home! And with these basic supplies on hand, I am able to create all of my yummy sweets and treats! 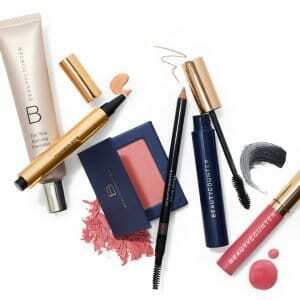 It has taken me a long time to settle on what exactly my favorite products are, but I’ve decided and I’m sharing with you my absolute must have staples. 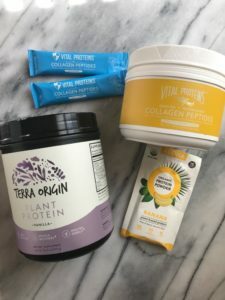 From snacks to dressings to protein powders, scroll down to see what I must have at all times! None of these below are affiliates, but just genuine products that I love and am happy to support. Supplements: I don’t take many supplements because I really truly believe in the power of food. With that being said, I take collagen every day because I love the effect that it has on my skin, hair, and nails. They are all the healthiest they have ever been and I’ve seen a huge difference ever since I started taking it. I use Vital Proteins and love putting the vanilla + coconut in my coffee. I also only use protein powder in my smoothies and sometimes in baking. I get plenty of protein through other foods in my diet, but I really enjoy the thickness and creaminess it adds to those. Two favorites pictured here: Terra Origin and ALOHA. Perfect Bars, which also double as a quick meal replacement until I’m able to get to a larger meal. Granola – I ALWAYS have granola at home. Its perfect for topping smoothies, adding to yogurt, eating straight out of the bag…you get it. Pictured here is my favorite grain-free granola, Paleo Passion Foods. I also love Purely Elizabeth regular granolas as well. Dates – these are hands down my favorite ingredient ever. I use them in probably half of my recipe, mostly because they are the best natural sweetener, in my opinion. Nuts – I always, always, always have nuts on hand. They are the most perfect snack because you can pack and up and take em wherever you want, they are filling, and they are only made from one ingredient – nuts! Chocolate – Does this need an explanation? I don’t think so. Hu Kitchen + Eating Evolved are my faves right now. 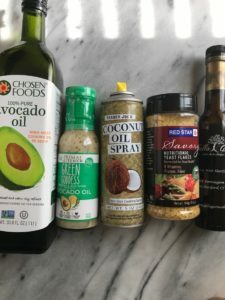 Avocado oil – this is my favorite oil to cook with lately, the smoke point is very high so I feel like it makes my veggies a lot more crispy. It also has a mild flavor so it doesn’t over power. It works really well with sauteing, too. Primal Kitchen dressings – these dressings are my all-time favorite because they are made from real ingredients that I feel good about putting in my body. So many dressings are filled with straight crap, but Primal Kitchens dressings are amazing. Coconut oil spray – favorite spray for when making pancakes, waffles, and sometimes even sauteing veggies. Nutritional Yeast – the cheese for vegans! Well, not really. But it has a naturally cheesy flavor that is perfect for topping veggies with, mixing with cashews to make a “cheese”, and so much more. Balsamic Dressing – When I’m not using dressing, I just drizzle this over my leafy greens with avocado or olive oil and I’m all set. Also great on veggies. Tessemaes BBQ sauce – my favorite BBQ sauce, sweetened with dates (see! ), perfect to add to chicken, homemade pizzas and not made with any funky ingredients. Tahini – if you’ve been following me, you know I LOVE baking with tahini. If you haven’t, try my I also love making homemade dressings with it. 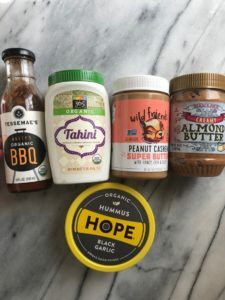 Hummus – one of my favorite sandwich spreads, dips for veggies + crackers. It is filling, nutritious and there are so many different delicious flavors. Bob’s Red Mill flours – coconut and almond, great for gluten free baking. Chia seeds – kind of random here but I put them in a lot of my recipes for baking or in smoothies. I also make chia pudding pretty often. They are the perfect way to get in some omega 3s and fiber. 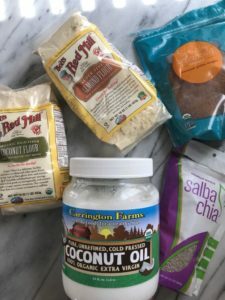 My list is always changing, but these are my most necessary pantry staples right now! What is one product that you must have in your pantry or fridge?